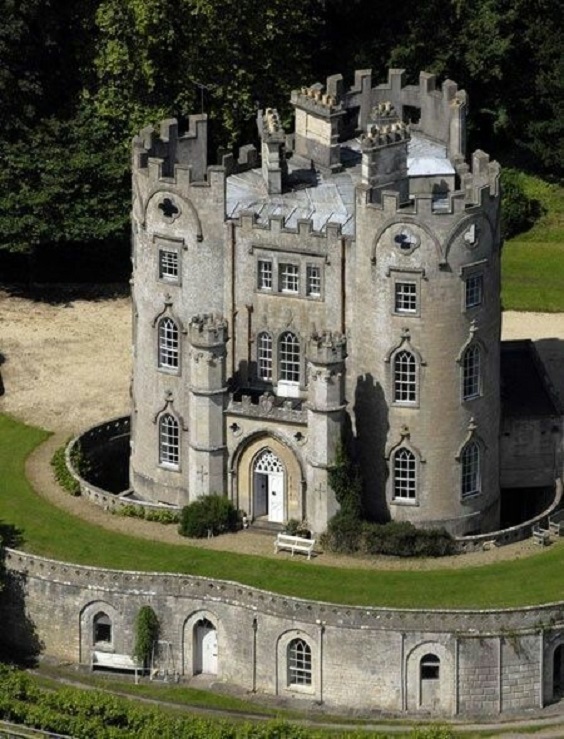 The 18th-century Midford Castle, near Bath in Somerset, England. Some say that the unusual triangular shape of romantic Midford Castle, which dominates the village and valley of Midford, three miles from Bath, represents the Ace of Clubsa reference to a fortune winning card allegedly played at the gaming tables by Henry Disney Roebuck, who built the castle in 1775. This theory was discounted in Country Life (March 3 and 10, 1944) by Christopher Hussey, who suggested instead that Mr Roebuck was ‘a wealthy romantic (who) chose the plan and design of the building chiefly for aesthetic reasons’, based on contemporary plans by John Carter, a Gothic enthusiast who worked with James Wyatt, and was on friendly terms with Horace Walpole. Whatever the origins of Midford Castle, now listed Grade I, its subsequent history is full of romantic twists and turns. In 1810, the castle was bought by one of the Conollys of Castletown in Co Kildare, who added the porch (said to give the Ace of Clubs its stalk) and built the nearby stables and chapel. The latter fell into disrepair after the last of the Conollys sold the house in 1901, since when the present owners, Mr and Mrs Michael Briggs, who bought Midford in 1961, have incorporated the chapel into the garden as a picturesque ruin. During their 45 nyear tenure, Michael and Isabel Briggs have patiently restored and improved the castle, buying back its various dependencies as they became available, and adding much of the surrounding 59 acres of parkland, grassland and woodland to create this picturesque country estate on the outskirts of Georgian Bath. ‘The castle is nowhere near as big as it looks,’ says Mrs Briggs, for whom the renovation project of half a lifetime has been ‘a tremendous pleasure’. Yet, not only has this remarkable lady brought up three children while overseeing the renaissance of Midford, she has also produced a steady flow of bestsellers, as Isabel Colegate, including The Shooting Party, the ‘Orlando’ trilogy, The Summer of the Royal Visit, and most recently, Winter Journey. Her husband, Michael, has been no less involved, both at Midford and locally, as the long standing chairman of Bath Preservation Trust.